Built in 1909, this house has had owners of Slovak, Italian, and French heritage thereby displaying the melting pot of Louisville families. It was also used as a rental for various coal miners. 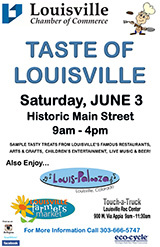 Get ready for the Taste of Louisville coming in June and kicking off all the summer fun in downtown Louisville. Spring is finally here! It’s a perfect time to gather with friends, family and neighbors for an evening of fun. 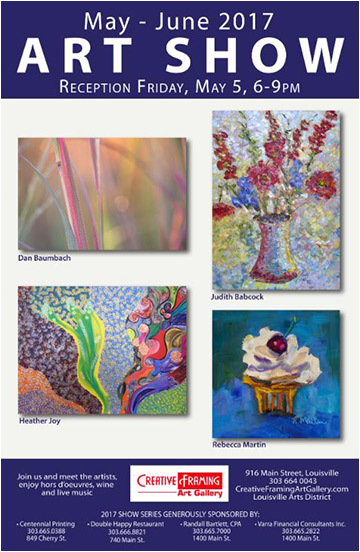 Join Creative Framing Art Gallery for an artists’ reception during the First Friday Art Walk featuring Judith Babcock, Dan Baumbach, and emerging artists Rebecca Martin and Heather Joy. 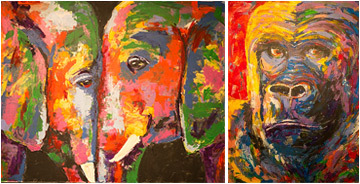 Enjoy light snacks and drinks while viewing a collection of colorful acrylics on canvas, inspired by a love and appreciation of animals by local artist Jennifer Grathwhol. Twenty percent of sales will be donated to conservation related non-profit organizations. 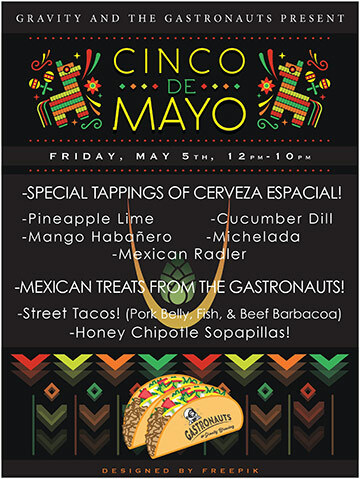 Celebrate Cinco De Mayo at Gravity Brewing, releasing its Mexican-Style Lager, Cerveza Espacial, in 12oz cans on May 5th at 12:00 pm at the Tasting Room. Gravity will also have several specialty versions of Cerveza Espacial on tap including Pineapple Lime Cerveza, Mango Habanero Cerveza, Cucumber Dill Cerveza, Red Beer (Michelada) & Mexican Radler. Gastronauts will be cooking up some awesome Mexican Street Tacos and Sopapillas! Sounds like a tasty way to kick off spring with friends and family at Gravity Brewing & Gastronauts at Gravity Brewing! Before you hit the Art Walk, get down to the Steinbaugh Pavilion to see the lively performances by the students of Dana V. Music, Revell Music, and Spring Creek Music! Celebrate Cinco de Mayo with live music and delicious food and refreshments from Pica’s Mexican Taqueria! Register now for this fun-filled camp with Laura and Becky who will employ story yoga, games, partner yoga and breathing to guide kids through a week-long exploration of Yoga. Activities will give kids life long tools for wellness and stress management. The camp is open to 4 – 10 year olds and the cost $150. 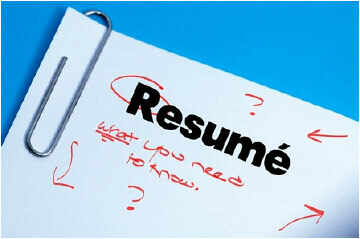 To register visit louisvilleyogajunction.com, or call 303.658.0365. 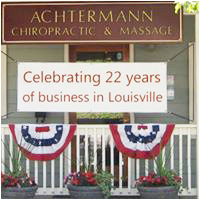 Congratulations to Achtermann Chiropractic and Massage for 22 years of business in downtown Louisville! The office is celebrating by having daily specials. Drs. Karen and Martin Achtermann, DC specialize in hands-on and low force Activator/ Arthrostim adjustments and Dr. Karen also does Acupuncture. The office also has two very talented Massage Therapists, Kristen and Victoria, who specialize in Deep Tissue, Sports, Swedish Massage Therapy, in addition to energy work and Integrated Therapies. Dr. Karen said, “We want to thank this health conscience community for supporting us all these years and look forward to many more years serving this community!” achtermann-us.com. Camille Mc Murry of Carnaby Yarns will talk about her journey into giant wool and share her no-needle technique. Ask her about her grandmother's shirt and how she came to be embraced in such big, beautiful chunky yarn. Come see the gorgeous yarn and samples, bring your own creative crafts and Get Happy! 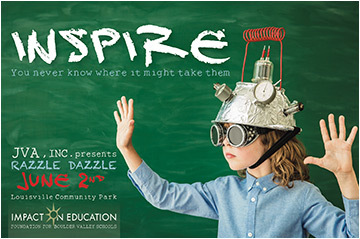 Come celebrate and support our own BVSD community of students, families, educators, and staff at the 35th annual Razzle Dazzle event! Held in Community Park, under the largest community tent in Colorado, this event blends great food and drink with a live and a silent auction of a variety of items and packages. Your attendance and participation at Razzle Dazzle allows Impact on Education to positively impact over 31,000 local students and educators. 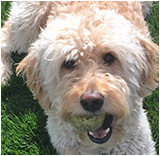 Please visit this link to purchase tickets and for more information, or call 303-524-3865. Make Mom’s day even better with a delicious, expertly prepared meal at 740 Front. Special hours are: brunch from 10:00 am – 2:00 pm and dinner from 4:00 – 8:00 pm. Brunch entrees range from $10-$15. Dinner entrees range from $15-$40. The restaurant will be offering various specials including its famous prime rib. Reservations are strongly recommended. A children’s menu is available for both brunch and dinner. 740 is also taking reservations for CU graduation weekend, May 12 and May 13. Early reservations for groups larger than 5 are highly recommended. Call 720-519-1972 to reserve your table. 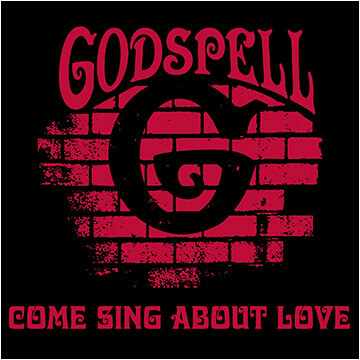 CenterStage Theatre Company is thrilled to present the 2012 Revival version of “Godspell.” Performances will be July 27 to August 6 at the Louisville Center for the Arts. This production is for actors college age or older. Please check for audition requirements on the CenterStage website: www.centerstagetheatrecompany.org or contact Jeanie Balch at Jeanie_balch@comcast.net. You will be directed to sign up for a specific time slot. 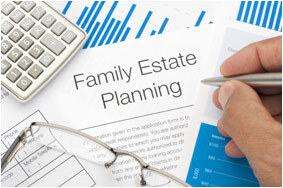 This class is an overview of the tools available to your family regarding estate planning. Learn about naming guardians for minors, wills, trusts, Powers of Attorney, pay on death, joint tenancy, probate, and much more. Gain understanding so you can make these very personal decisions wisely. Presented by Ariana Friedlander and Rosabella Consulting. 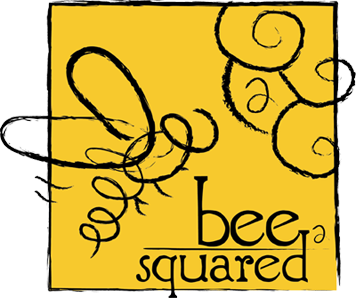 From 1:15 – 1:30 pm, Beth Conrey of Bee Squared will host a brief information session on the importance of honeybees to our ecosystems. Demonstrations and honey taste-testing will follow. At this Maker Expo, participants will not only learn more about honeybees, but will make DIY soap, sugar scrubs, and beeswax lip balm; sew a lavender scented sachet; and plant wildflowers in a compostable newspaper planter. This Expo is the perfect opportunity to interact with a variety of hands-on projects showcasing the Makerspace supplies and equipment. It’s a family-friendly afternoon of crafting, creativity, and inspiration. All ages welcome.